At this year’s Abu Dhabi International Book Fair, YA author and would-be/will-be publisher Noura al-Noman drove in from Sharjah to talk about translating literature for young people. She spoke alongside Dar al-Muna publisher Mona Henning, author and translator Sampurna Chatterji, and Literature Across Frontiers’ director Alexandra Büchler. Al-Noman spoke about the particular importance of translating science fiction into Arabic. This is an interest of hers “because of the fact that I’m focused on this rare genre.” Although al-Noman is producing spec-fic novels—two now, with a third in progress—there is a need for the genre to be enriched by translations if it is to flower, she said. This isn’t just true of science fiction, al-Noman said. Other languages could contribute a lot to the Arabic-language flowering of genres that are less common in Arabic, including fantasy, paranormal, and graphic novels. Büchler echoed this: “When you translate, this is one of the major obstacles. There is very little support available, and when publishers apply for grants, when they want to publish books translated from European languages, they [the grant organizations] usually would go for adult novels. It’s still quite rare” for grant money to go to children’s books. 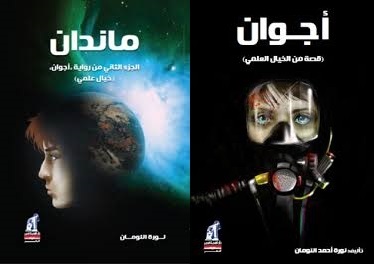 So, if it’s not going to make al-Noman a wealthy woman, why bother translating other science fictions into Arabic? That’s why al-Noman wrote her first science fiction novel, Ajwan, and her second as well: Mandan. But two science fiction novels are hardly enough to build interest in the genre. There are other scattered efforts in different Arab countries, and at the Abu Dhabi fair, for instance, al-Noman ran across a science fiction novel for middle-grade readers by debut Emirati author Shaima al-Marzouki. But science fiction has yet to fully take off in Arabic. Does Ahmed Khaled Tawfiq’s “Utopia” count? Absolutely. There are certainly some SF works in Egypt, in Morocco, in Syria (or there were in Syria). But not a mass movement.